Each generation of blank feeders, such as this new model just being released from AP&T, represents about a 20 percent improvement in terms of speed of operation, according to AP&T representatives. This new feeder employs a pneumatic gripper, rather than a conveyor, to transfer blanks through a lubrication station and then center the blanks after lubrication. Modular automation systems coupled with plug-and-play technology allow metalformers and their automation suppliers across the board to streamline the process of implementing automated press-tending apparatus. As a result, days, if not weeks, are carved from the process of system design, build, install and testing. Automation equipment for pressroom duty has evolved so that blank feeders, destackers and robots run more quickly, more precisely and with more robustness than earlier adaptations of the equipment. “Each generation of blank feeders represents about a 20-percent improvement in terms of speed of operation,” says Todd Helms, account manager for AP&T North America, Inc., Monroe, NC. “Metalformers investing in upgrading their current automation technology, as well as shops looking to minimize labor costs, appreciate and see the dividends in the growing use of plug-and-play components. The use of standarized modular components and the implementation of prewired interfaces make automation systems easier to install and test. This reduces our build, delivery and installation time. The entire process is simplified, providing faster startup times for the customer.” Helms estimates that the typical (if there is such a thing) press-line automation project that used to take 12 weeks to design, build and install now occurs in just eight weeks. “For example,” he says, “a stamper can integrate a destacker and blank feeder in a stand-alone application in four to five days, then start up and test the system in a day or two. Tom Sipple, material handling technology leader at robot and robotic system supplier Motoman Inc., West Carrolton, OH, also notes the advantages delivered by the newer state-of-the-art PLCs employed by automation-system providers. These PLCs, he says, combine the safety and cell control logic in one rack. 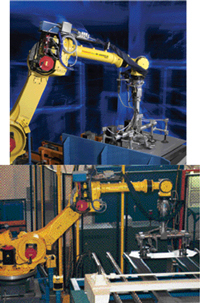 One technology enhancement credited with improving the flexibility of press-automation systems is dubbed by robotics suppliers “payload identification.” Payload ID allows the robot programmer to input to the material-handling robot how heavy the payload is —the weight of the end-of-arm tooling plus the weight of the blank or part. Stephan also points out that in the early days of integrating robots with stamping presses (“robotic automation made big inroads into pressrooms in the early to mid-1990s,” he says) all of those initial installations had system integrators placing material-handling gripper tooling onto the ends of robots designed primarily for spot welding. While spot-welding robots are tuned to perform a series of short start and stop moves and thus require high acceleration and deceleration capabilities, press-tending robots must perform with a completely different type of motion profile. Robot vendors in recent years have worked hard to develop product lines to accomplish this—they now offer application-specific robots with motors and software tuned specifically for pressroom service. Sipple also points out the advantages to metalformers of using coordinated motion among multiple robots, working together to feed large or otherwise clumsy blanks. Coordinated motion—the ability of a controller to precisely track the movement of multiple robots in a cell—long has been used in robotic-welding applications, “and is growing in acceptance for material-handling applications, such as press tending,” Sipple says. He notes a trend toward automating the stamping of automotive frame rails—large, heavy parts—where a pair of robots relying on coordinated-motion controls each grab one end of the rail blank and load and unload a press. 180-deg. rotating fixture table to feed a press. 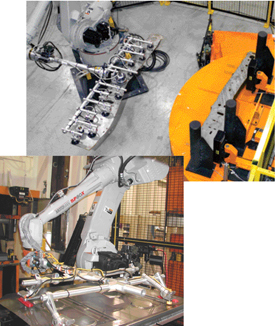 At left: A five-axis Motoman robot tends to a press at an appliance manufacturer. Neat blank stacks allow these Fanuc robots to cleanly destack blanks and load them into the first die station of a press. 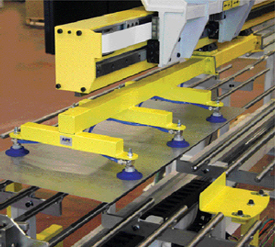 Where stacks are not so neat, stampers employ vision systems to view the blank as it is carriers by the robot and signal any necessary adjustments in blank orientation to ensure that the blank sits quickly and properly in the die. “Provided that metal stampers have reliable presses and well-maintained feed lines and other auxiliary equipment, the benefits of press automation can readily be realized,” says Sipple. “But if a line is not dependable, the stamper that employs automation will make a few parts really quickly, and then have to stop the line to fix something. But of all of the robotic applications we work on, in terms of benefits and return on investment, press tending offers one of the highest rates of return. See also: AP&T North America Inc., Yaskawa America, Inc., FANUC America, Inc.